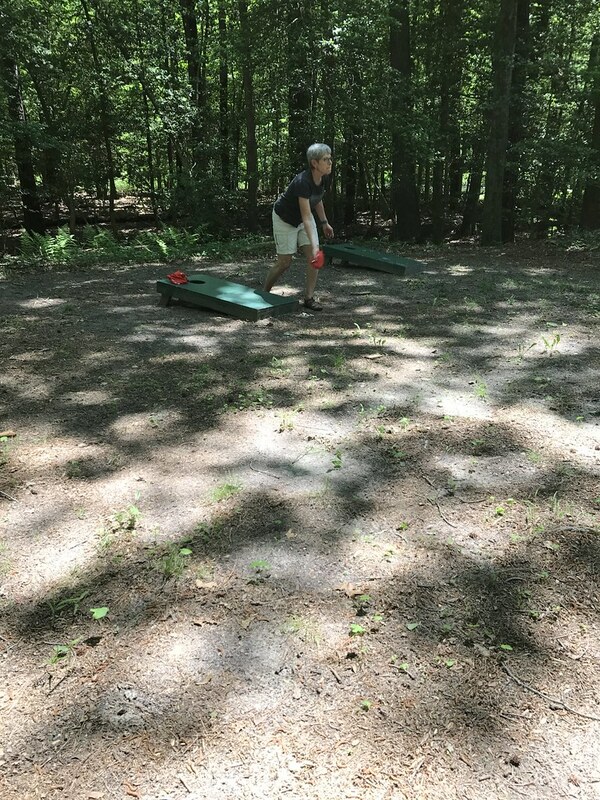 Our camping experiences date to Girl Scouts and, for me, a few miserable outings in high school. That was quite awhile ago. But we thought trying again might be an antidote to my desire for a small RV. 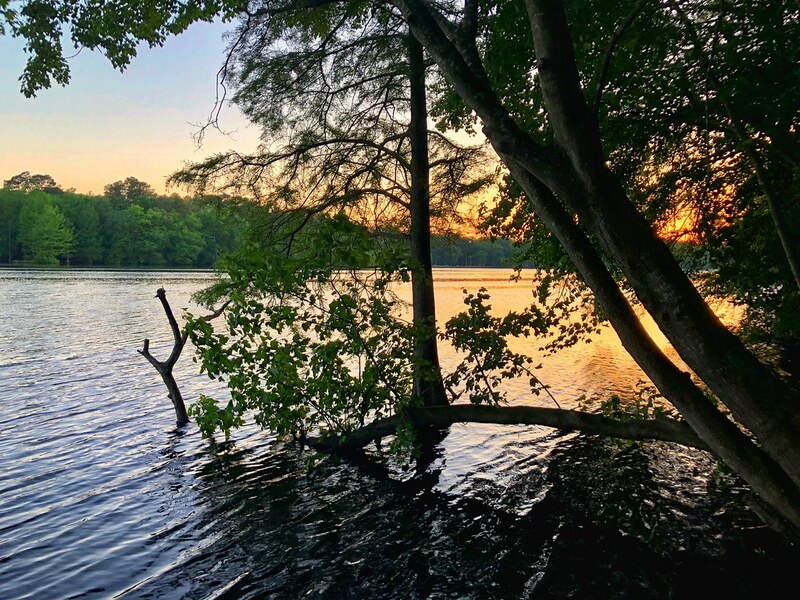 The two-night outing to Trap Pond State Park near Laurel, Delaware, was only about 25 miles from our house. We would not starve. 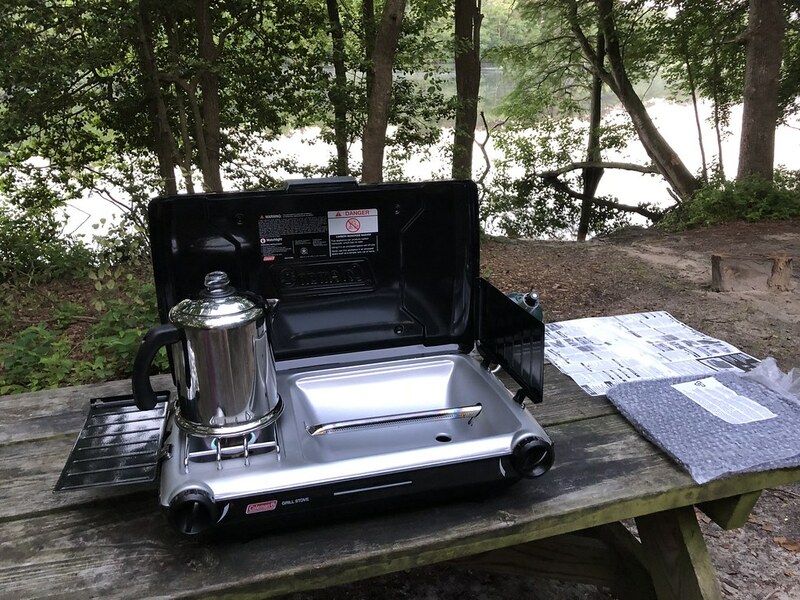 We could try out some of the delights of camping, such as walking to the bathhouse and lighting a propane stove, without feeling stranded. 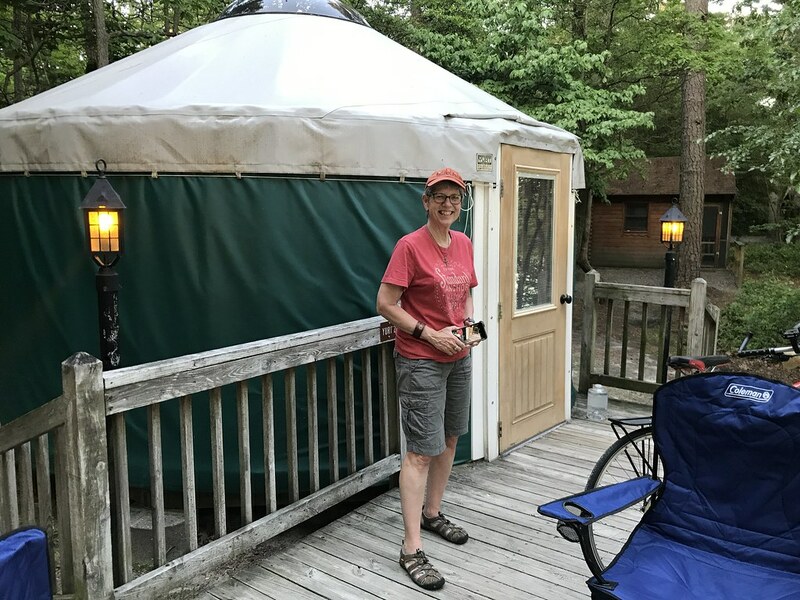 We decided to reserve a yurt, of which there are two at Trap Pond. The rate was $40 a night before Memorial Day. 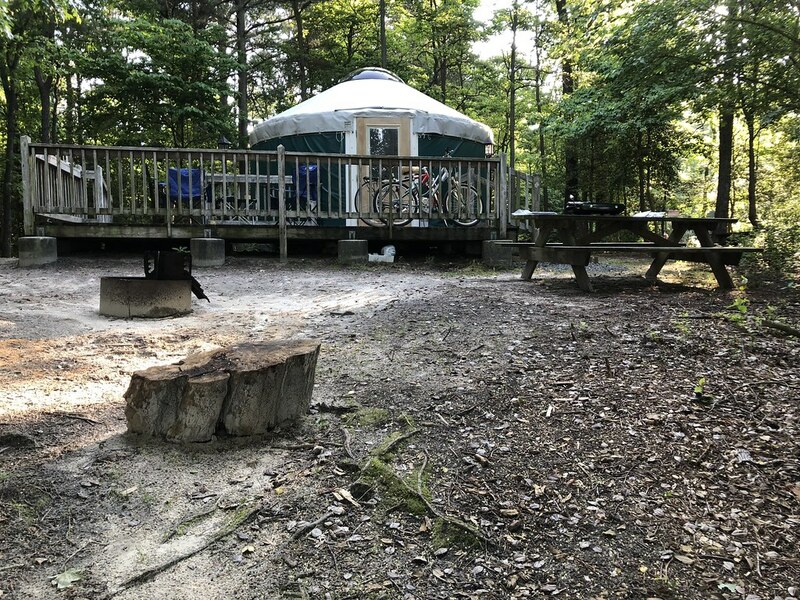 “Yurts are a fun and easy alternative to pitching a tent yourself, but still allow you to experience the rustic feel of camping outdoors. 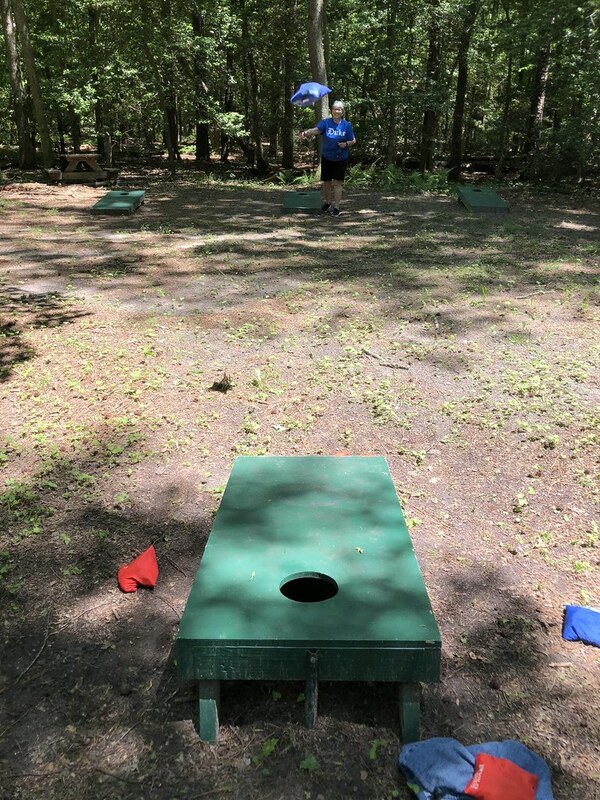 Perfect for the new camper!” the Delaware State Parks website promised. We had bought the Coleman stove, sleeping bags, camp chairs, table and some other essentials – but no tent yet. We had the sense that the preparation we were doing and the stuff we were taking wasn’t worth the effort for two nights of camping. When I realized my kayak would not fit easily into the bed of my pickup, we opted for bikes instead. 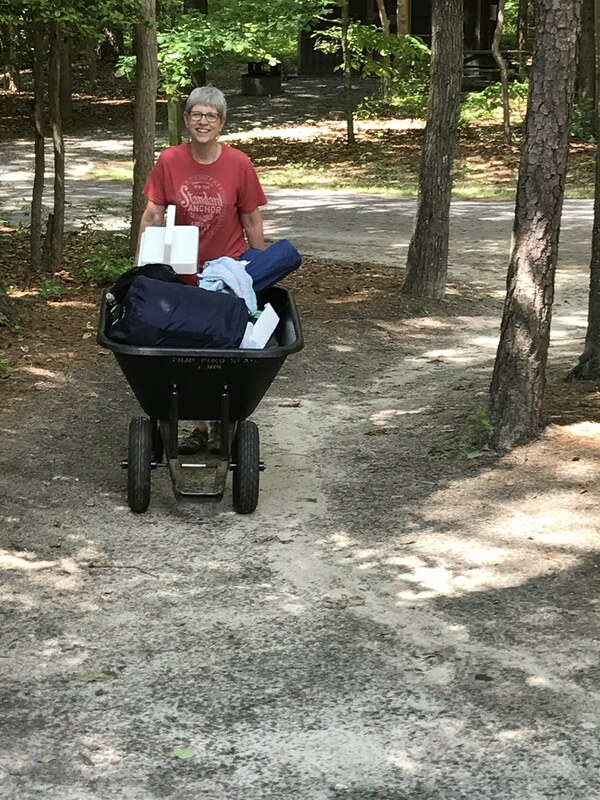 We didn’t want to look like extras from “The Grapes of Wrath,” carting a ridiculous amount of crap, so we left behind a few things we should’ve brought: my Nikon and long lens, a board game, a potholder, another sleeping bag (we brought sheets and pillows). Turns out, everyone else brought a lot of crap. 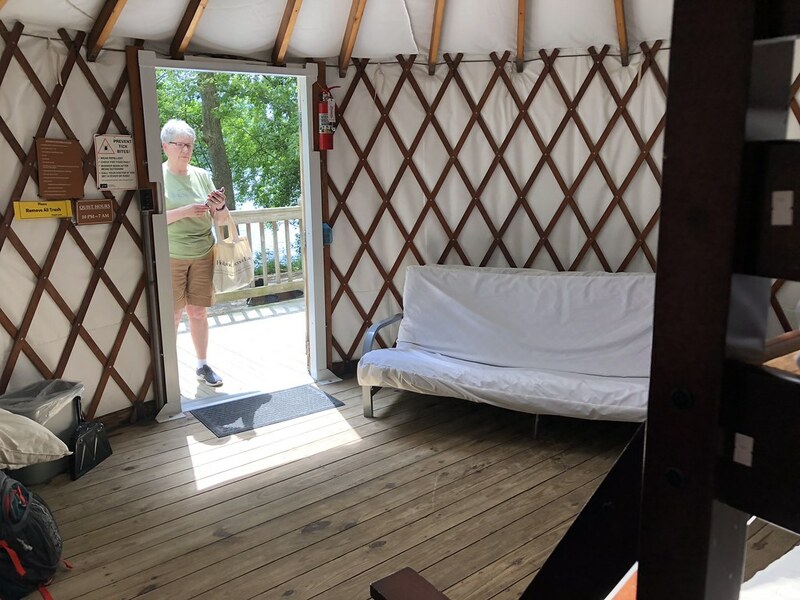 The inside of the yurt exceeded our expectations: clean, airy, cozy and with a portable air conditioner that was set at 65. The yurt had a deck and a better water view than our neighboring yurt and mini-cabins. Immediately I regretted not bringing the kayak because I could have slid it right into the pond. These aren’t exactly soul-wrenching regrets because we had a wonderful, relaxing time, but I should’ve brought the camera, too. An intensely yellow prothonotary warbler decided to hang out at our campsite, which is unusual. I had never seen one so close, and it alighted on the picnic table, the deck and tree branches just a few feet from us. We saw other birds: an Eastern kingbird, great blue heron, geese, chickadees and many tufted titmice, but the warbler was the star. 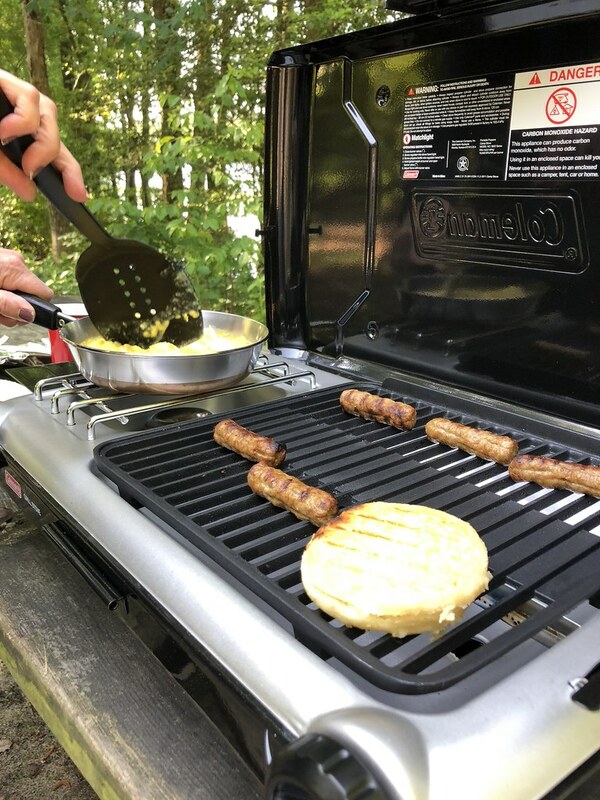 Since we had never used propane, and Sue is afraid of it, we decided not to get too carried away on the Coleman stove, which had both a burner and a grill. 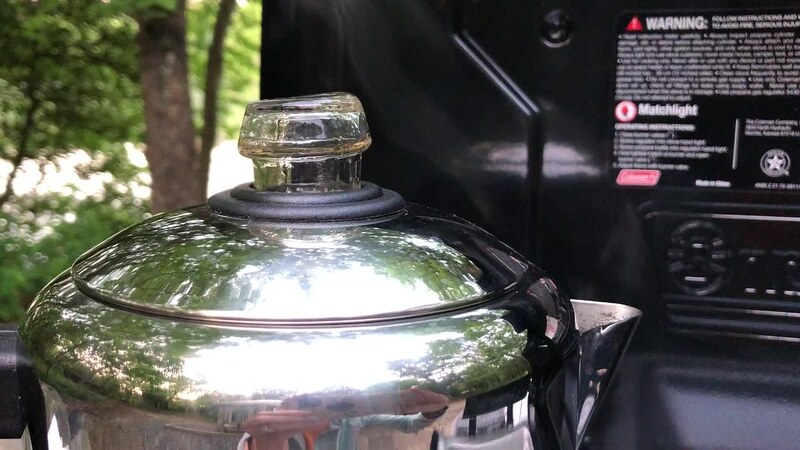 We did hot dogs, percolator coffee, scrambled eggs, crumpets left over from the Royal Wedding, and Brown ‘n’ Serve sausages. (We had turkey burgers for the second night, but opted for hummus, crackers and carrots instead.) I watched a 23-minute video on how to attach the propane canister, light the stove, and use the various features. The next morning, we rode our bikes down to the bath house and used the shower stalls. Really, it wasn’t that bad, and this bathhouse was ancient. There was an outhouse a shorter distance from our yurt. Note to self: bring flip-flops. The first night, we froze to death despite getting up several times to turn down that little air conditioner. It was not very comfortable; I have to be honest. I woke up in the middle of the night and my lower back, hips and legs were in agony. If we go again, we will probably bring our air mattress and/or another sleeping bag for padding. The trip also cured me of any residual desire to buy an RV. I just wanted a small one, but the larger Class A McMansions dominated the campground. Why would you bring your whole house on a camping trip – what’s the point? They looked like a lot of work, too. And most of the people in them did not look like, well, outdoorspeople. We will go again. We are looking at Shad Landing at Pocomoke State Park near Assateague and Snow Hill, Md. Will we buy a tent? Probably not. 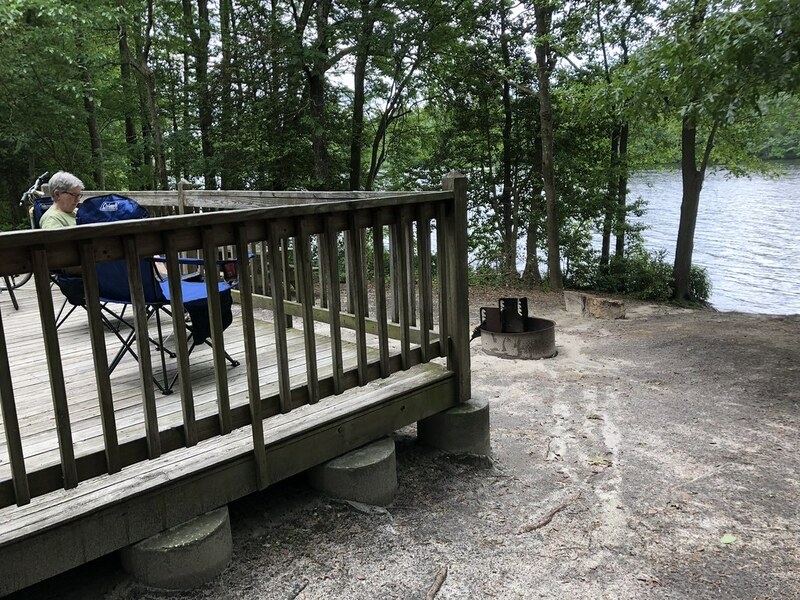 But we enjoyed the quiet, the water, the birds, the woods and the relaxed sense that we were detached from the more annoying aspects of civilization. Well, civilization was down the path in the motorhomes but we could not see or hear it. Our suggestion is to keep it simple the first time – don’t go backpacking in The Maze at Canyonlands your first time out. 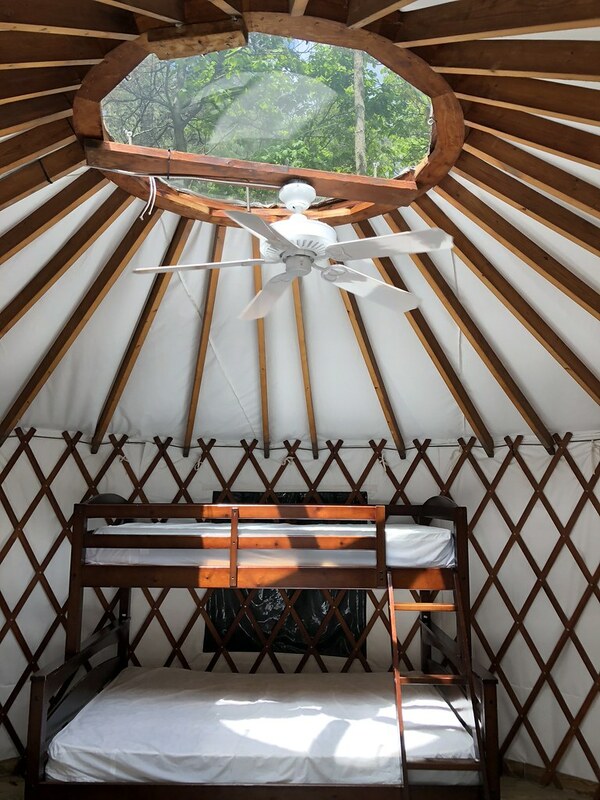 Try a yurt or mini-cabin, not a tent. Don’t try to make a gourmet repast on the Coleman stove. Do try it without massive amounts of electronics (we barely had a cell signal) and, yes, even without a bathroom.